The reality of what it means to be a territorial male lion has become apparent recently. Two of our male coalitions, Mkongwe & Co and Kichaka & Co, appear to have been ‘battling it out’; in the early hours of the 24th December these collared males met and Kichaka stopped moving. I confirmed him to be dead 2 days later. He had been mostly consumed so the cause of death was undetermined but a fight might be the cause. On the 5th January, men at one if the ranch outposts investigated a terrifying ruckus near where they were staying to find two male lions attacking and badly wounding a third within 1km of where Kichaka was found dead. 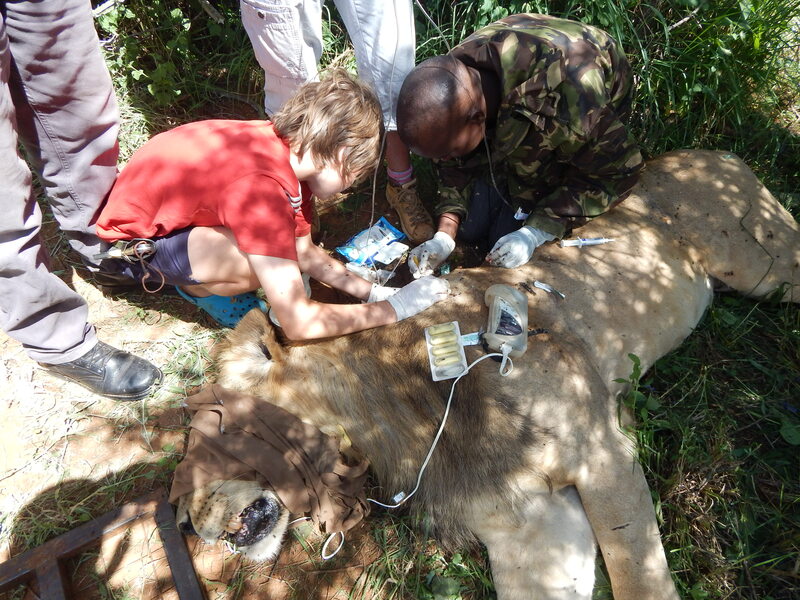 After observing the badly wounded male for 24 hours, Steve and I intervened with the help of the KWS vet Matthew Mutinda, immobilised the lion, cleaned out his wounds, filled him with antibiotics and revived him. He was covered with serious bite wounds, some of which were already showing signs of infection but he may yet recover, assuming he can avoid his attackers. Two of the wounded male’s coalition partners remained nearby, apparently unwilling to leave their wounded partner. Although these males are uncollared we suspect they are the remains of Kichaka’s weakened coalition. KWS vet working on cleaning the lion’s bite wounds and administering antibiotics. Although the identity of the attackers was not clear, Maggie was likely the cause. She was nearby at the fight and the attacking males could have been uncollared members of Mkongwe’s coalition, who were associating with her closely in the days immediately preceding the fight. Unfortunately, the lady herself stuck to thick bush and we were not able to see if she was mating with one of Mkongwe’s coalition partners. Mkongwe himself was not present at the recent fight but he was not far away eating warthogs he had dug out of their den. 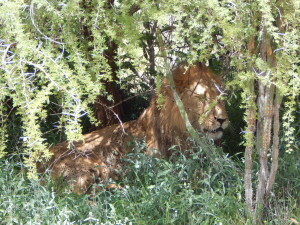 When Steve and I saw him he was extremely aggressive, threatening us even when we kept a respectable distance. His aggression was so unusually intense that neither Steve nor I wanted to stop near him long enough to fish out a camera – there was obviously something going on! While the thick bush makes direct observation difficult, later analysis of collar data will help fill in the gaps in these fascinating social interactions – was Kichaka actually killed in a fight, or by something else? Are the wounded male and his friends the remaining members of Kichaka’s coalition? Were the attackers from Mkongwe’s coalition, and were they mating with Maggie? Hopefully the collars will tell. In the mean time we still hold out hope that the wounded male will survive to fight again. To correlate accelerometer outputs of the collar with actual animal behaviors, accelerometer data from the SMART collar are matched to time-synched video and diary recordings of instrumented animals moving freely in enclosures and open fields. 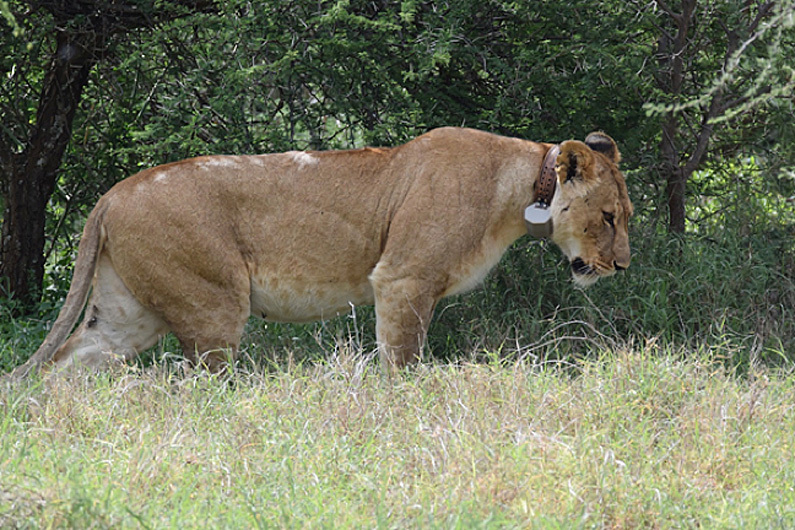 Behavior of a wild female lion wearing the SMART collar is monitored by observers. A diary of these behaviors is then used to match wild activities to accelerometer data recorded by the collar (Photo TM Williams). Example of accelerometer signatures from the SMART collar worn by a mountain lion. 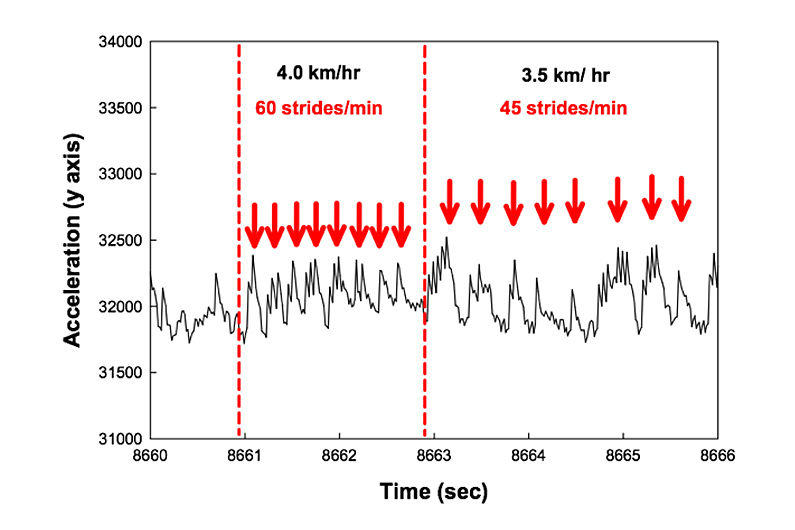 Each arrow shows one footfall during running at 4.0 kilometers per hour and fast walking at 3.5 kilometers per hour. In this portion of the study, we correlate locomotory events with energetic demands of the lions. This is accomplished by measuring the metabolism of animals from zoological collections that are trained to wear the SMART collar while walking or resting on a treadmill. 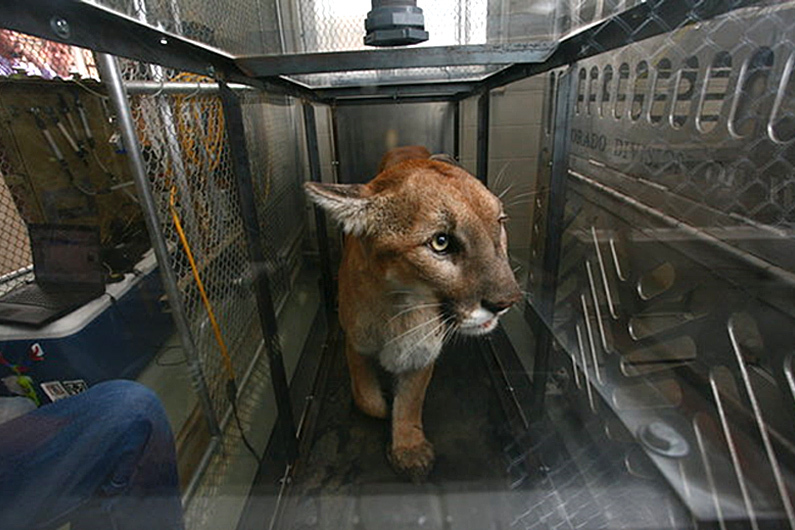 Mountain lion trained to walk in a metabolic chamber on a treadmill for energetic calibrations of the SMART collar (Photo Colorado Parks and Wildlife). Our species specific, calibrated SMART collars are then deployed on free-ranging animals. In this way we are able to monitor the instantaneous behavior and energetics of wild lions moving across the African landscape. We have successfully used these methods to examine a wide variety of exercising mammals including minks, domestic dogs and river otters, wolves, mountain lions and soon African lions and polar bears. 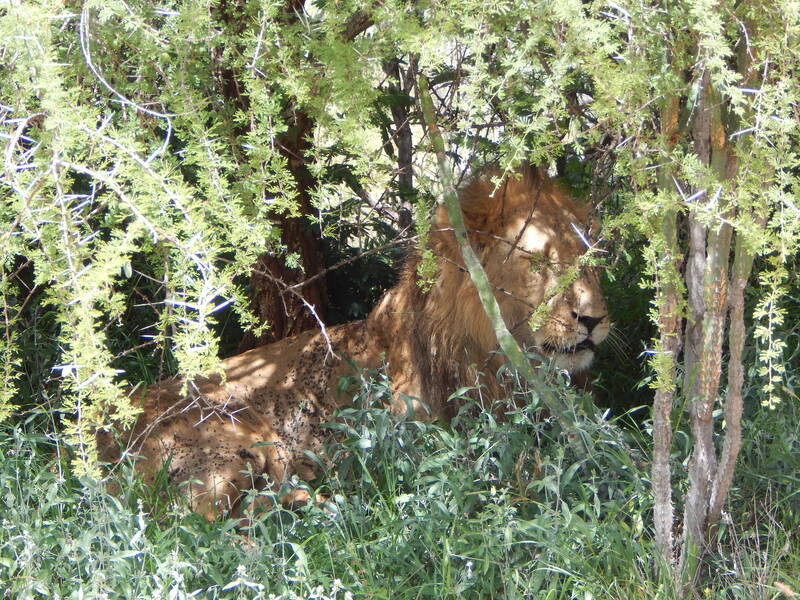 Welcome to our African lion tracker. We are using state-of-the-art tracking collars to follow a number of male coalitions and female prides in Laikipia County Kenya. Data is transmitted via Iridium satellite to our servers in Santa Cruz were we make it available to you to remotely explore the lives of these amazing animals. How far do lions move in a day? How big are their home ranges? Who is courting who? 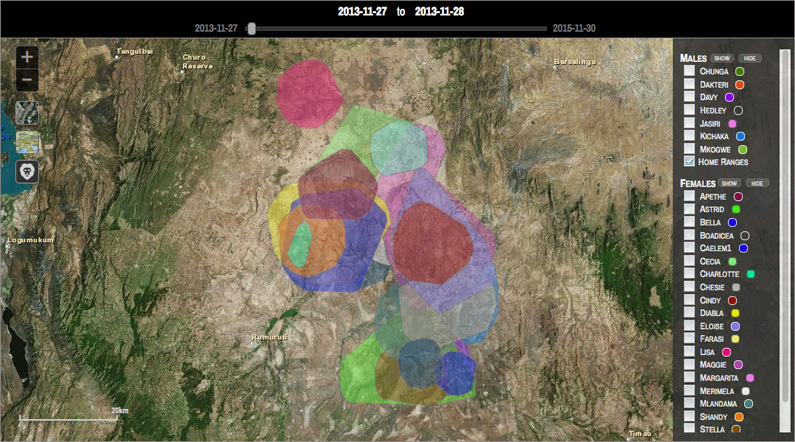 Here you can explore the data and answer these and many more of your questions about lion biology. Over time we will also add more features to explore the data in new ways. So keep coming back to see what is new. Please note that we delay the data by 7 days for the public to protect the current location of the animals. Current data is shared with local landowners, however, so they can do their best to avoid confrontation between livestock and lions.